You have a big vision for your company, and you want to get your whole team on board. As the entrepreneur, it is your role to design what the future of your company looks like. 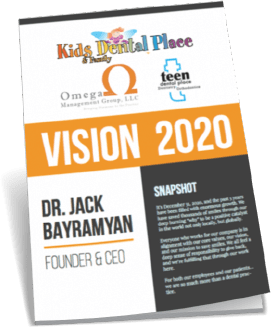 To make it crystal clear, so your team, shareholders, and clients can get on board to help you turn that vision into a reality. Because when you can clearly see, feel, and experience your vision, you’ll start to put the universe and your mind to work for you. You’ll move forward with laser-like focus, and attract the right people to help you get there. You are going to build a brand new home. If you are the general contractor, you aren’t also the person painting the walls and putting the flooring down. You hire the right team to help you with those important roles. The same goes for you as the entrepreneur. Your goal is to build the vision, make sure that everyone is crystal clear of the vision, and make sure they are in the right roles to create that vision. 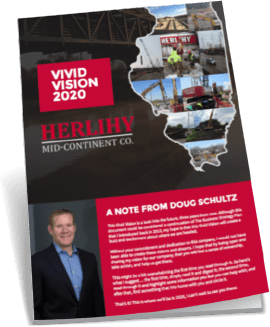 …Put your Vivid Vision document on your Job Postings for new hires and simply say, “Read this before applying” this will immediately set you apart from all of your competitors. …Have confidence that the entire company is aligned on the vision before pivots and/or rapid growth so you grow with a solid foundation under you. 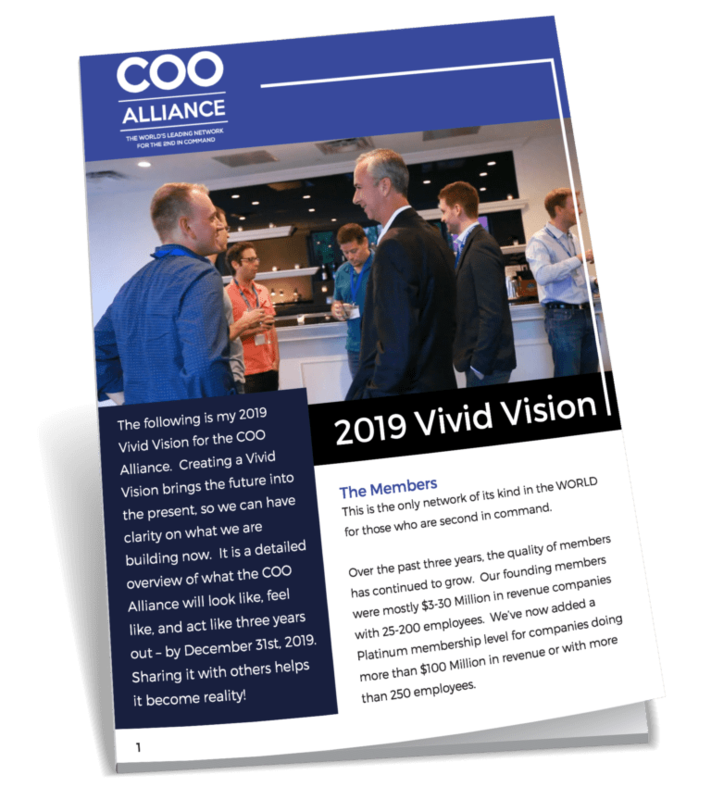 …The Vivid Vision is the most powerful tool to get your internal team aligned of where the company is headed and where they see themselves in the equation so they get and stay motivated. …As the Founder or CEO everyone is looking to you for vision. You need to be crystal clear of where you are headed so you can lead your team with confidence. The Vivid Vision communicates what is in your mind, on paper. …When you let your key customers, partners, and vendors know where you are headed they naturally want to support you in getting there. At Conscious Copy & Co. we have a team of some of the best direct response copywriters in the world. When we write your Vivid Vision we are writing it like a powerful sales letter- to attract the right people, and repel the wrong people. 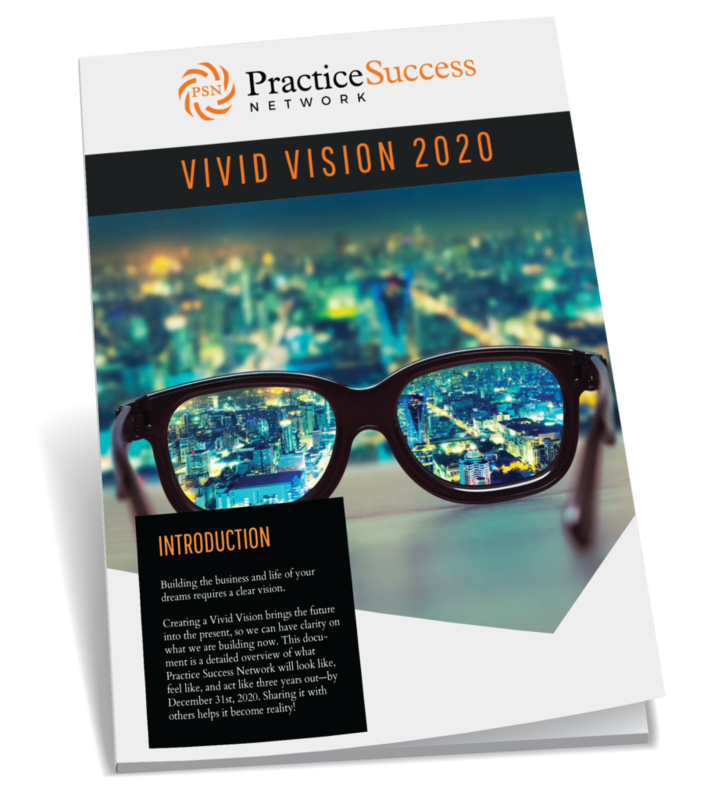 On this 2-Hour Virtual Call our Vivid Visioneers will interview You (The Founder or CEO) on your 3-Year Vision. We will ask a series of questions to help you get crystal clear of what you want each area of your company to look, feel, and sound like as if you’ve already achieved it. We will help you sift and sort your thoughts so you can simply show up and share. After The Vision Expander Session™ our Vivid Vision Copywriter takes that vision that was in your mind and puts it onto paper. We will send you over your Vivid Vision Draft 1. You will provide your feedback via a simple Vivid Vision Scorecard™. From there, we take your feedback and flip it into a Vivid Vision Draft 2 and then Final Version of copy. 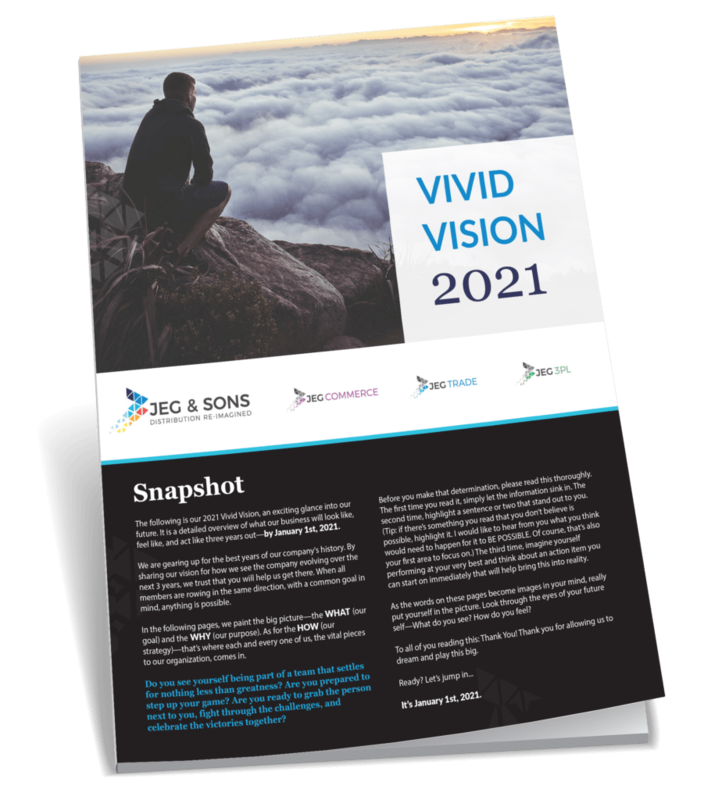 After the Vivid Vision Copy is complete we go into the Vivid Vision Design Phase. 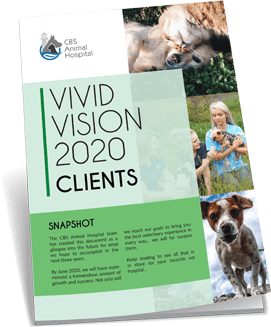 We have a simple Vivid Vision Design Questionnaire™ for you to fill out so we can capture the look and feel you want. Our Vivid Vision Designer will put powerful images to the words for your personalized Vivid Vision. 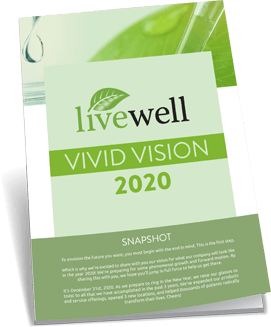 The final product is a custom, made-for-you 5-6 page Vivid Vision booklet. It will get you, your team, your customers, and your vendors emotions racing with excitement when you read it. You continually strive for that next level of success. You want you and your team to stay focused on your end goals. You have a good idea of where you're headed, but could maybe use a little more clarity. 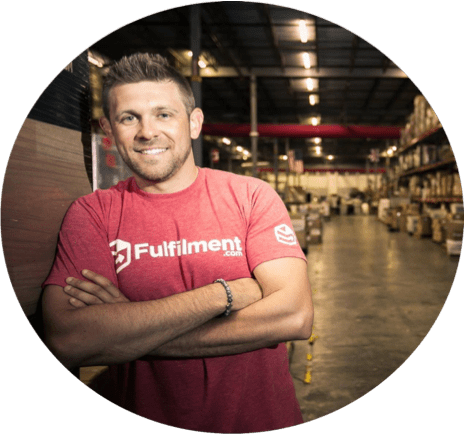 You currently make at least $10,000/month in your business. You don't have any clarity on what you want. You are juggling about 10 other projects and this is a priority, but not really. You're not willing to invest in your business. Once you fill out the application, you will be invited to book a free Clarity Call where we will discuss your end goal for this project and see if Conscious Copy & Co. is a good fit and can help you! 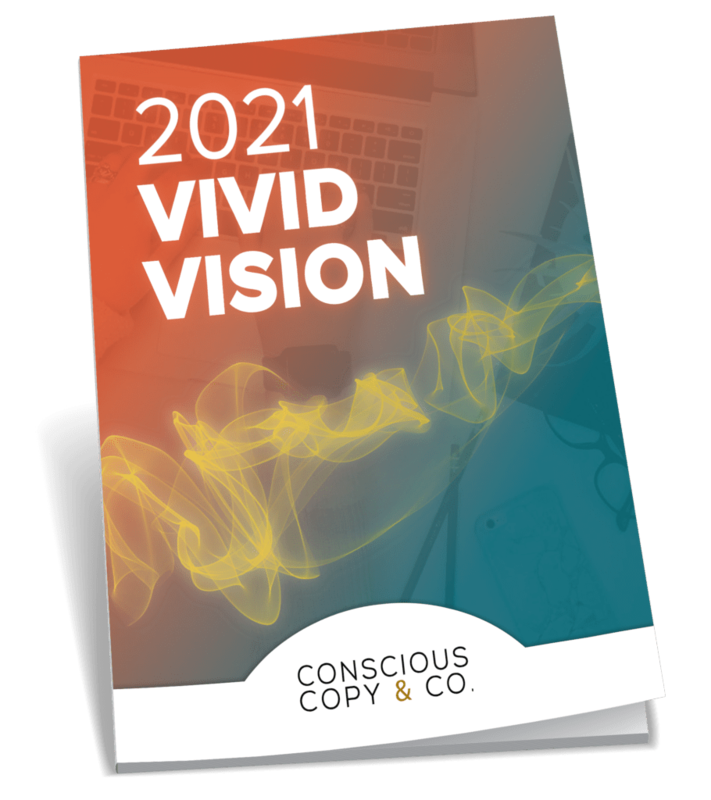 "After months of struggling to finalize my Vivid Vision on my own, Conscious Copy made it easy, fast, and fun. The way Jen pulled the vision out of me initially was an amazing process that brought me into the future with clarity, beyond what I could have possibly done with any other copywriter I could hire for this. I was thrilled to see it quickly come to life after that. I've always recommended doing a Vivid Vision for any serious entrepreneur - now I always recommend having Conscious Copy write their Vivid Vision." 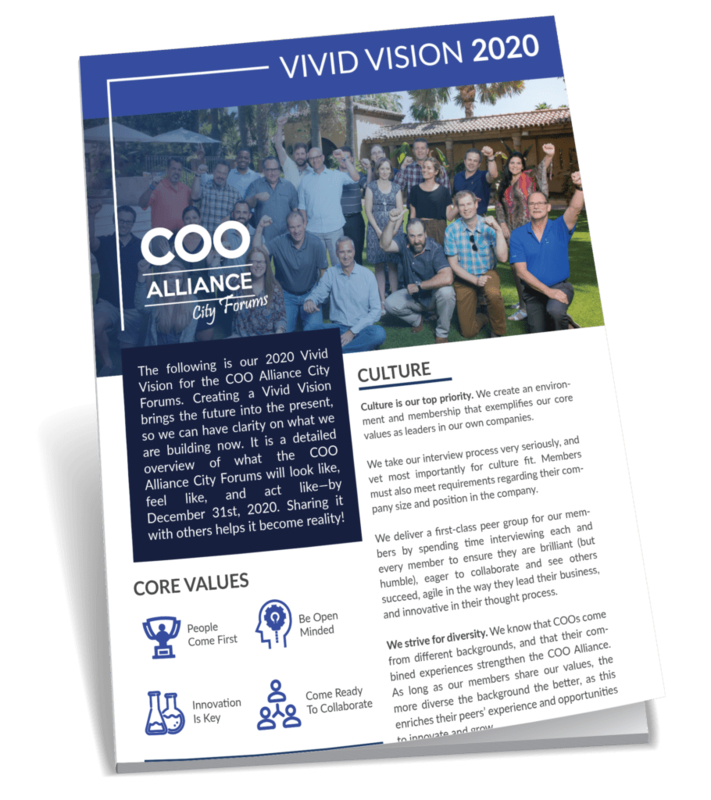 "Much thanks and appreciation goes out to Jennifer Hudye & Conscious Copy for helping to bring my 2020 Vivid Vision to life. It was super cool to come home from vacation and see this amazing canvas poster waiting for me that has the K2 core values on it. Very cool. If you would like to start making your business dreams come true, start by getting clarity on where it is you want to be. Who should write my Vivid Vision? Should I get my team to help? The entrepreneur / business owner should be the only one writing the vision. The team will help to figure out how to put the plan together to get to that end-goal, future vision. 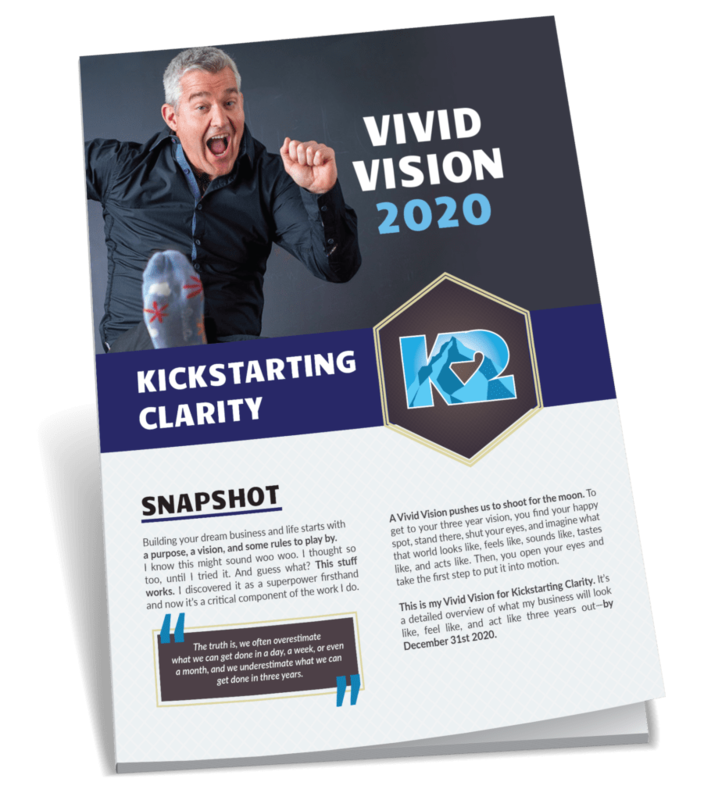 If you have too many people creating the Vivid Vision, it gets confusing and the entrepreneur’s / business owner’s vision can get lost. However, you should definitely get a copywriter to help make the words really pop off the page to make it clear, powerful, and exciting. What about my competitors? 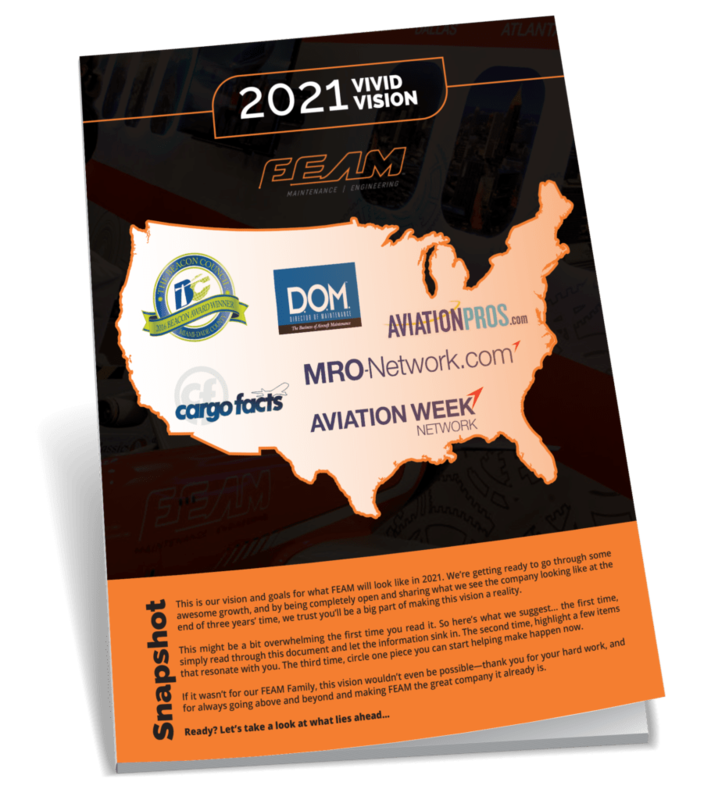 If I'm sharing my Vivid Vision, then my competitors will know what my vision is for the next three years. Nobody can implement your vision like you can. If your competitors are so focused on your vision, then they’re going to get distracted from their own business. Don’t worry about your competitors looking at your Vivid Vision. Elon Musk talks about his vision for Tesla all the time… nobody can touch his vision because it’s his. How should I create my Vivid Vision? Your first step should be going to a space outside of your office, preferably in nature or somewhere that’s very visually appealing. This will help your creativity and innovation to be released. 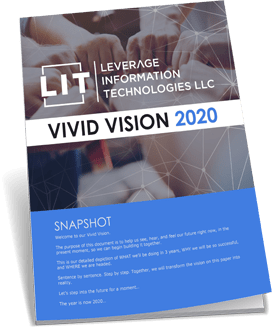 Make bulleted notes of what you can envision each different area of your company looking like three years from now… as if it is today. From their, hire a copywriter to help you turn your bullets into clear, concise, powerful words that POP off the page. 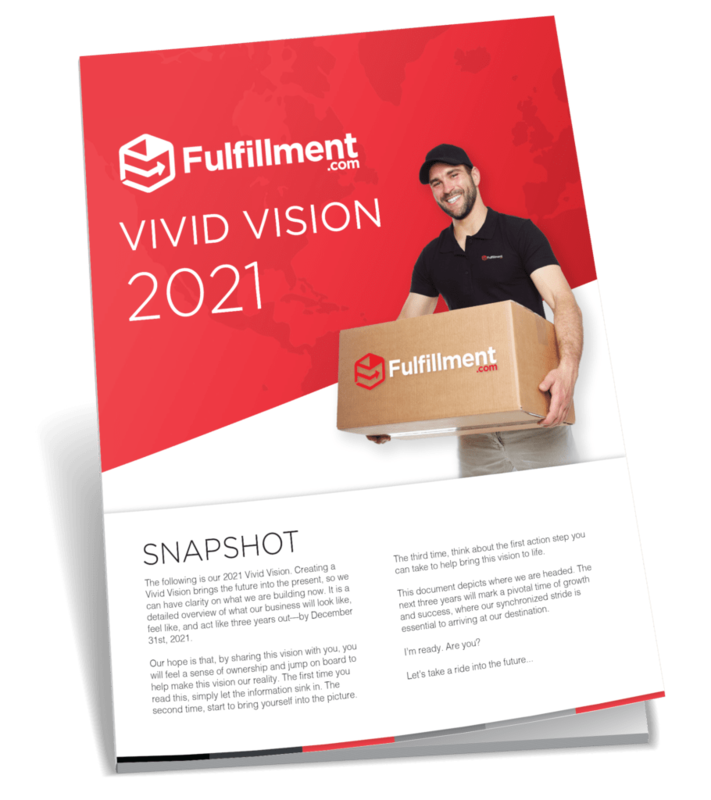 Once my Vivid Vision is created, how do I roll it out to my team? Plan a meeting to get together with your team. Make sure that you print off a copy for every single person. Read it out loud. Get each one of your team members to circle the parts that get them really excited. If some of your team members don’t circle anything, or they don’t believe in it, let them know that now is the time to quit. Your Vivid Vision needs to be polarizing. You need to make sure that you’re bringing the right people on in order to execute your vision. How often should I look at my Vivid Vision once it's completed? You should be reading it at least once a quarter with your team, shareholders, and clients. As for yourself, you should be reviewing it at least once a month. A powerful way to implement this is to create an audio recording of it, and then listen to it at least once a week to constantly remind yourself of what you’re working towards. Can I see examples from Conscious Copy? Absolutely! Click any of the following to check out our past work! Just "click" on any of the examples below to open them up and see into the Vivid Vision.